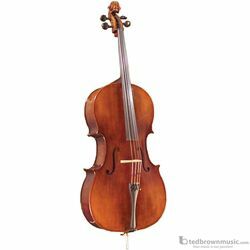 The Samuel Shen Stradivari Willow Cello has a warm, beautiful tone featuring a fully-carved spruce top, with inlaid purfling and carved aged willow back & ribs. It also features ebony fittings and is finished with hand applied oil varnish. It also includes a bag for protection of your instrument.